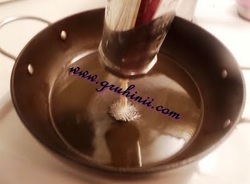 Wash urad dal and soak in water for an hour. Cook it in a pressure cooker for 4 to 5 whistles. 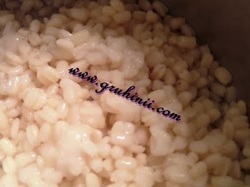 Mash the cooked urad dal. You can also grind to fine paste in a mixie. 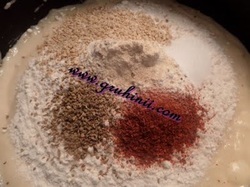 To it add the Rice flour, red chilli powder, salt, sesame seeds, carom seeds and hing. Mix well. Add enough water and make a stiff dough. Now heat oil in a pan. Fill the dough into the Chakli mould and drop small chaklis into the hot oil. 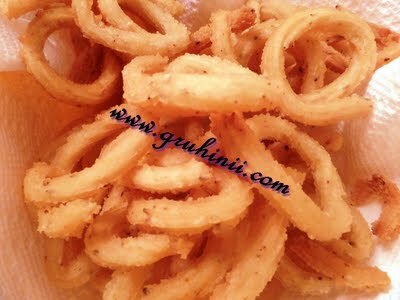 Fry until they become crispy, (when they turn to golden color) remove them from the oil and place them on a kitchen paper.